This beautiful, award-winning luxury crewed charter yacht offers 4 Queen guest cabins, each with en-suite bathrooms. In typical Fountaine Pajot fashion, everything is bright, open and contemporary, with neutral colors and clean-lined joinery that gives the boat the air of a fine urban apartment. Meet Tommy and Alexis, a fun and outgoing team of outdoor enthusiasts who will show you an amazing and adventurous week on board the beautiful Black Tortuga. Tommy’s sailing skills and vast knowledge of the Islands and its hidden gems, paired with Alexi's love of the ocean and wonderful cooking, will guarantee an unforgettable week amongst the beautiful Caribbean Islands. Tommy developed a passion for sailing at a young age, growing up sailing on the Chesapeake Bay, he quickly advanced from racing small dinghies to acquiring a keelboat of his own at age 15. Taking to the sea after high school for a year of cruising around the Caribbean he then returned to Virginia to complete his university studies. Adventure has always been in his blood. During University his passion for sailing was peaked more than ever and he took every break possible to get back on the ocean completing multiple offshore deliveries. Alexis has always had a love for the ocean, travel, and adventure. The beach has continually been an important element in her life. She studied Pre-Veterinary at Coastal University in South Carolina, the campus was in the heart of the shore-side so you can imagine that every spare minute she had, she was involved in some activity on or in the ocean. Soon after college she was bitten by the travel bug and embarked on her first solo backpacking trip to South Africa. She grew up in a Spanish and Italian family so not much more needs to be said – life at home was all about the food – prepping it, cooking it and sharing it with others. She fell in love with the diverse styles of food wherever she traveled which has allowed her to ‘play’ with the different flavor combinations and add a ‘wow’ factor to her menu. Catching lobster or fish and having it for lunch or dinner is the true meaning of sea-to-table – meals on Black Tortuga could not get any better! While backpacking in South Africa, she met up with a team studying and diving with Great White Sharks and was invited to join them. She received her Master Scuba Diving Instructor Certification and that then allowed her to travel and work in over 40 countries, apprenticed with scientist in places like Fiji, Australia and the Philippines. Alexis has been diving for 11+ years. So not only is she a great chef but she can take you scuba diving too! Tommy and Alexis met each other in 2017 and worked together running charters from St. John, sailing in regattas and boat transfers - A super team! The Virgin Islands are abundant with beautiful beaches, floating bars, brilliant hikes, and incredible snorkel and scuba dive spots that Tommy and Alexis cannot wait to share these with you on board Black Tortuga. Contact us for rates and current availability or to book a charter aboard Black Tortuga! 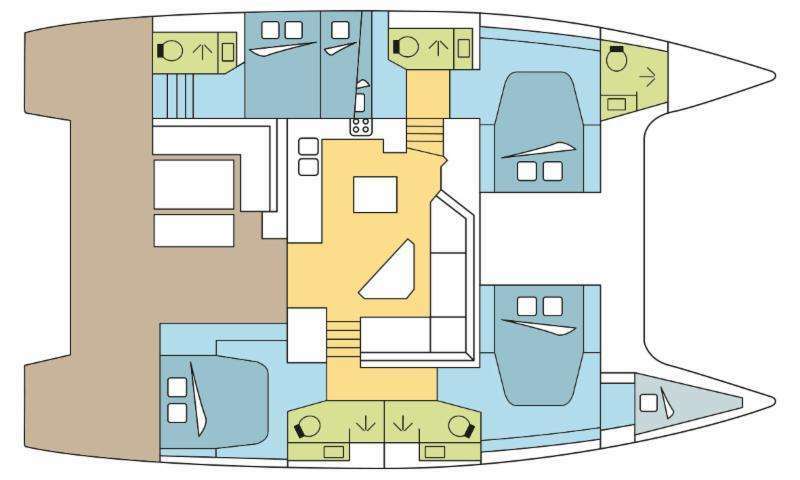 3 queen cabins with ensuite bathrooms and 1 twin cabin with ensuite bathroom. The crew will vacate their queen cabin for the twin cabin if 4 queen cabins are requested for charter. Breakfast is served with your choice of tea, coffee, juices and fresh fruit. Bloody Mary’s and Mimosas on request! Eggs Benedict - Served on a fresh bagel or English muffin with your choice of smoked salmon or prosciutto, grilled asparagus, baby Rosa tomatoes and hollandaise sauce. Shakshuka - Slow cooked, topped with fresh avocado and feta cheese, served with homemade jalapeño bread. Acai Bowl - Served with yoghurt, fresh seasonal fruit, homemade granola and sprinkled with honey and chia seeds. English Breakfast - With your choice of scrambled/fried/poached/boiled egg, with a side of honey glazed bacon, breakfast sausage, baked Portobello mushrooms, hash browns and a fresh pastry or bread. Optional cheese platter. Toast Selection - Of rye/brown/white bread topped with cream cheese, cucumbers, tomatoes, red onion, smoked salmon and perfectly halved boiled eggs, topped off with capers and lemon slices. Seasonal Fruit Platter - Served with yoghurt, granola, homemade bread and a side of a meat/cheese selection. Exotic Mushroom Frittata - Accompanied with gypsy ham and mature cheddar cheese, Served with a fresh strawberry chia seed pudding. A refreshing selection of cold beers, wine, soft drinks, water or cocktails will be served with lunch. Grilled Chicken Salad - Served on a bed of couscous, tomatoes, cucumber, and feta drizzled with a honey mustard dressing, a hearty helping of home made Tzaziki and a fresh slice of lemon. Catch Of The Day - Served with muscles in a creamy white wine garlic sauce, grilled prawns, fried calamari, white bait and a side of Mediterranean rice. Optional fresh Caprese salad. Gourmet Beef Burgers - Served with Camembert cheese, sliced tomatoes, fresh herbs and an exotic mushroom sauce. Sweet potato fries as a side. Grilled Salmon - Served on a bed of warm Greek styled quinoa, drizzled with a ginger, honey and soy reduction. Stuffed Tomatoes - Filled with pesto couscous, topped with mozzarella, pine nuts and fresh basil, drizzled with a balsamic reduction. Bell Pepper Stir-fry - Served in a ginger/teriyaki sauce, accompanied by a grilled chicken breast and toasted sesame seeds. Pulled Chicken Quesadillas - Served with grated mature cheddar, fresh purple cabbage, homemade salsa, sour cream and guacamole. Catch of the day sushi platter - Served sashimi style, Californian style, as a hand roll or maki. Pickled ginger, wasabi and soy sauce to taste. Caramelized Onion and Brie Bruschetta - Served with a balsamic reduction and a selection of freshly sliced cucumber, carrots and hummus. Health Cracker Selection - Served with cream cheese and your choice of smoked salmon or prosciutto. Topped with fresh herbs and lemon slices. Cucumber Wheels - Served with salmon pate’ and fresh lemon wedges. Enjoy your meal with a glass of wine, water, a cocktail or a beverage of your choice. Roast Cauliflower and Chickpea Curry - Served with fluffy white basmati rice, topped with sour cream and fresh coriander. Creamy Langoustine Penne - Served with roast Mediterranean vegetables, topped with fresh basil and Parmesan cheese. Exotic Mushroom Risotto- Served with char grilled chicken pieces, crispy bacon and tender stem broccoli stalks. Barbecue Sirloin Steak - Served with steamed vegetables, pepper sauce and creamy garlic cauliflower mash. Moroccan Lamb Chops - Served with crispy roast baby potatoes and creamed spinach and butternut. Creamy Coconut Chicken Thighs - Slow cooked and roasted in a garlic/chili sauce, served on a bed of fluffy white rice and steamed baby spinach leaves. Deconstructed Cheesecake - Served on crushed Oreo biscuits and berry coulis, served with fresh kiwi fruit and lemon zest. Upside Down Cake - With a moist Nutella center, topped with espresso icing, a Raphaella coconut ball and fresh mint. Pancake Stack - Served with maple syrup, cinnamon and sugar, lemon and Nutella. Homemade Peanut Butter Ice Cream - Served with crushed graham crackers and fresh bananas and mint. Chocolate Dipped Strawberries - With whipped coconut cream and pistachio nut shavings. Berry Crush - Frozen berries, Gin, Brown sugar, soda water. Watermelon and Lemon Infusion - Peach slices, Vodka, Tonic water and fresh basil. Pineapple Punch - Vodka, soda water and fresh mint.